The other day I took Aliza out for a walk in the stroller. It was only the two of us and we went on a bit longer walk than normal. We rounded the corner near Paul Elementary and started up this sidewalk. My personal memory of Paul, Minidoka, Idaho only extends about 28 years into the past for this little town. However, my historical and genealogical memory of this town extends a bit, in some instances back to the founding. As I walked up this little sidewalk I found myself in my memory riding down this sidewalk on a bicycle many years ago. Looking at the sidewalk, I would be willing to venture that it is the same concrete. Indeed, up ahead at the end of the cinderblocks on the right, you can see part of the foundation for the old Adams Building that used to stand here. I found myself remembering that building and what a sad day it was when it had to come down (the easy route is to always tear them down). 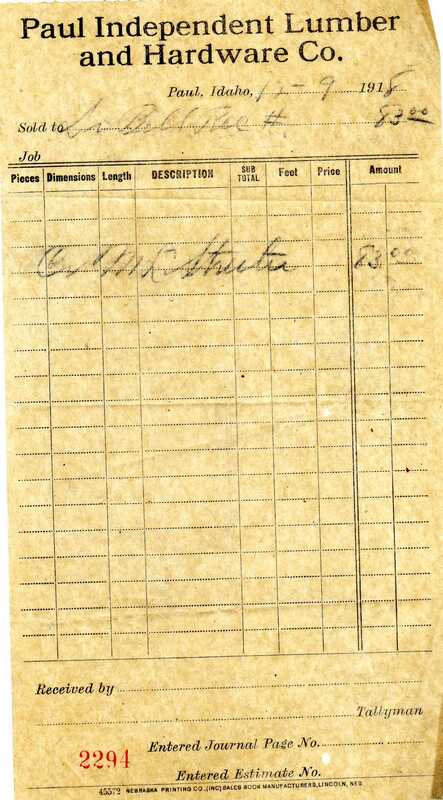 Interestingly enough, Mr. Adams was the son-in-law of Henry Schodde whose name is well-known in the area and whose family still haunts this town with its presence. Immediately across the street to the left is the building that I attended Kindergarten (not in the picture). The tiny building is now a self-serve laundromat. Who would have thought a Kindergarten would become a laundromat. For the most part, the building is just as it was when I was there. Across the street behind the stop sign is an old gasoline, service/repair station that has been there since the 1920’s, 1930’s. Only in the last 10 years did they remove the old gasoline pumps I remember being there as a kid. The other buildings part of the lot are newer, probably of 1940’s vintage, but one of them still reads “Alignment” on the back with an old tire stand remaining. Even as a kid I imagined what it must have looked like in its heyday. I do not know the last time the building ever was used for commercial use, but I see a door open once in a while, or that at least someone is doing something within. What secrets might still be locked in there? Across the intersection diagonally is an empty lot. But I know there used to be a lumber yard there at one point, and then some type of granary at another. It was this lumber yard that my Great Grandmother Ethel Sharp Ross (previously Streeter) purchased the lumber to build her confectionery that was located, I believe, within the same block just beyond the water tower (which is in the picture). Just beyond the now solitary light pole on the left side of the road was a butcher shop. I still remember the iron beam that hung out the front of the building for bringing in of the beef. I must have been 4 or 5 the first time I remember being inside and seeing the meat hanging from hooks, the coldness of the freezer, and the sound of the saw slicing through the flesh and bone of an animal. I remember the cat/monkey woman who supposedly lived in one of the old buildings between what was then the vacant lot in my youth of the lumber yard on the corner and the butcher shop. I do not recall seeing any cats or monkeys, but I remember her and the smell that came with her. There was a building that was missing somewhere in the row, supposedly from a fire. That building had previously been the Post Office. The first building on the other side of the street now used to be the Paul City Offices. 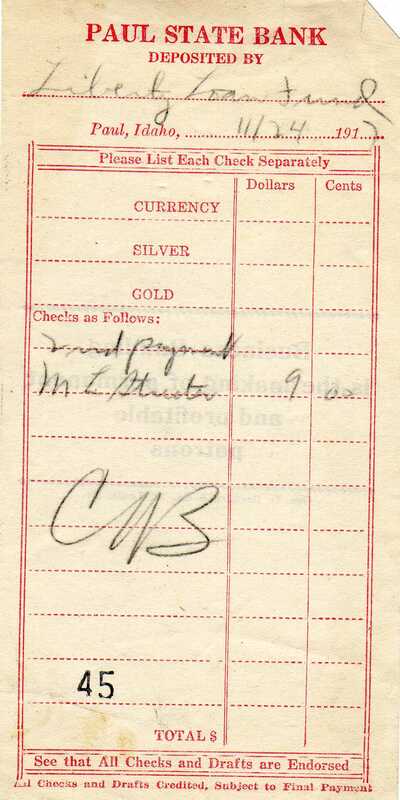 I remember going in with my mother to pay our city bill. I remember attending City Hall Meetings there as part of school and Cub/Boy Scouts. I even remember help organizing the Christmas Light drive, sale, and auction where the City of Paul replaced its Christmas lights with the now present fixtures, the old ones now relegated to the very street in this picture. The two-story building beside it used to house the firehouse, now a car repair and auto-body shop. In there I learned first aid and CPR for the first time. In there we met firefighters, learned safety, and helped prepare for charity drives. We also got the tours of the firetrucks which any boy loved. Just beyond the old firehouse is the Masonic Lodge which must still have the same sign it did 30 years ago, it has not aged well. On the same side of the street beyond the old garage mentioned above is what has been a bar as long as I could remember. Beyond it is the Old Paul Grange, whose use I am still not certain. The old writing of the Grange still shows and the building does not seem to have been used beyond the 1940’s. I don’t know who owns it, but that would certainly be a building that would be a time warp to enter. Some of the front reminds me of pictures of my Great Grandmother’s store, Streeter’s Confectionery and I wonder if I might not have its place mistaken. I am certain, but it is probably just a wish that something of her past remains on the street that Paul seems to have so fully discarded. Just beyond the Grange and on the corner of the same block stands the old Paul State Bank. It was Mikey’s Bar while I grew up but the monogram in the brick work leaves no mistake, it was once a bank. It is this building that I wanted to buy to open my law practice. Restore the building, set to building a practice, and leave behind a preserved part of Paul’s quickly dwindling architectural past. The owners were not interested and so I watch the building hoping it does not age beyond repair. I look at it every time I enter or leave the Post Office. Maybe some day, but then again it is probably for the best. Burley is likely a better place for a law practice. The post office stands where it does today having been dedicated about 1962. I mentioned the missing building between the butcher and the monkey woman where the Post Office used to stand. Anyhow, President Kennedy was still President and J. Edward Day was Postmaster General when the new building was dedicated, the plaque says so. This is of interest only because he served such a short time and it was during his tenure that the zip codes were established, giving Paul its 83347. Inside this post office I remember going to our PO Box 12 and turning the knob for the combination and retrieving the mail. Mom had to hold me up because it was near the top. We eventually discarded our PO Box at our new house about 1984 and then the Post Office got the now present key boxes. It was also this Post Office that the swinging door took two of my fingers clear down the bone. When I walk in the Post Office and sometimes I can remember the horror as I watched the lady cutting away some of the mangled skin with scissors and the sewing it back together with some of her hair. How many people do that today? The scar is still there. I remember being told that Connor’s used to be in the space between the now present Post Office and the old Hotel, of which only the first floor remains. Connors of course moved out near the interstate in the 1960’s and I believe their present building indicates its construction decade. Then of course the old Hotel Building which in its day claimed full plumbing, something that was very new about 1920. The second story has been removed, the first floor looking very enclosed and lost since its long past heyday. There was a safe/bank deposit on the east side only about 15 years ago, even now it has been removed and bricks fill the void. 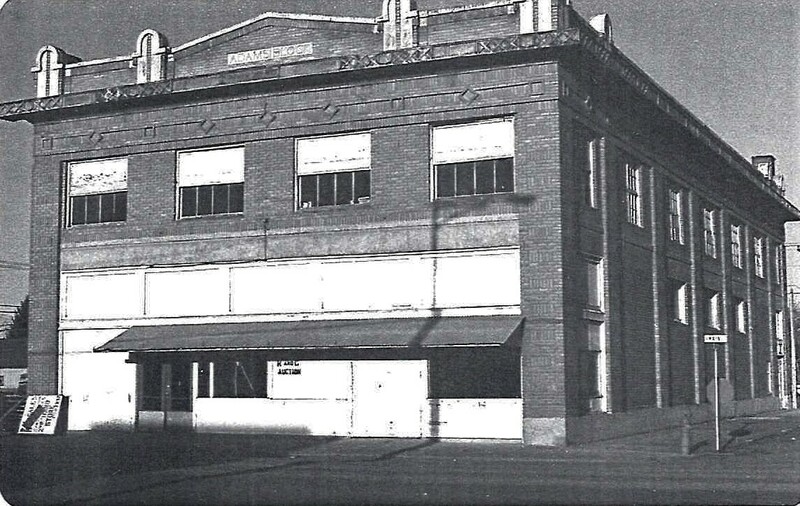 Pictures of the building show that it was once lined by large window stores that opened out to Idaho Street. Now it is just a brick building, its façade completely lost to time. It is my understanding that the now present Idaho Street was once Main Street. 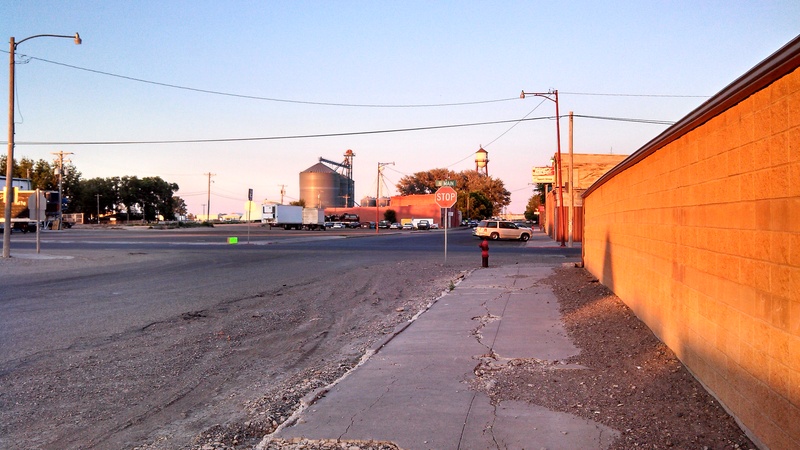 Now it is Idaho Street, Main Street intersects it at the intersection immediately in front of the picture (also 600 west of Minidoka County). Like many historical towns the relied on the railroad to such a degree, this town apparently also had shops and buildings that faced the railroad. I do not believe any still exist, or at least if they did, not in my lifetime. One thing is for certain, what was once a bustling town center has now turned into a blight. I am not sure Paul will ever recover any of its lost past or achieve much of the character it has lost, but I can hope. This street continues down through a part of Paul that once contained many houses built and provided by Amalgamated Sugar. I do not know if any of those homes remain after relocation. I tend to believe the one I once lived in the first few years of my life was one of those homes. I doubt we will ever know. Looking at this picture it seems inconceivable that Paul once contended to become the County Seat. The vote if I recall was somewhat close but eventually lost out to its then slightly larger neighbor to the east, Rupert. Contrasting the two towns now is somewhat embarrassing but both have their difficulties. Rupert has maintained its identity through the decades and seems determined to keep it. Paul seems to just let the winds of change sweep in whatever they bring. Funny enough, behind me in this picture stands Paul Elementary. The current building replaced the earlier building which was once Paul High School. Minidoka County in an ingenious move consolidated all the high schools in the County to form one high school, Minidoka County High School (known as Minico). By doing so they promoted efficiency and order that has carried them now well for over 50 years. Cassia County has debated the same and still deals with the costs and difficulties of four separate high schools. While a larger county, I have to tip my hat to Minidoka County for their foresight and planning. It just seems a bit sad that Paul and Minidoka County seem to have lost some of that vision they once had. Then again, I am only young. I don’t know anything beyond my experience. But I hope Paul will improve and focus on important things for the future. A new city park certain improves the feeling of community, builds the common good, and helps build a city from the ashes of its past. I hope it will continue to improve and not neglect its past. 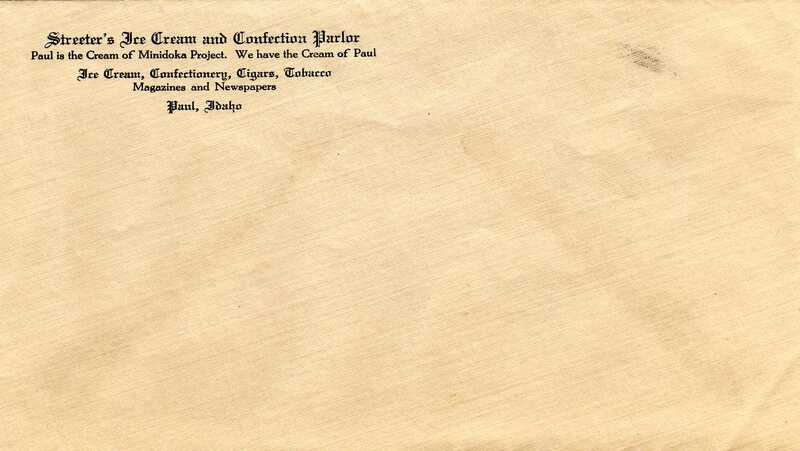 Indeed, I hope the letterhead from my Great Grandmother’s store will someday again be true. Notice the monogram of the bank and go check out the building.